Governments and multilateral agencies have devoted significant resources to titling programs around the world. Rigorous empirical evidence on the positive impacts of tenure security supports these efforts (Di Tella et. al., 2007; Field, 2003, 2005, 2007; Galiani and Schargrodsky, 2004, 2010). However, most of these programs have focused on granting titles and have not put in place mechanisms to ensure that properties remain formal after future transactions (e.g., sales and inheritances). Currently, there is increasing evidence that titled properties are becoming de-regularized due to unregistered transactions, which may reduce households´ ability to benefit from tenure security in the future. Even though its importance, de-regularization of titled properties is a topic rarely considered in the literature. A notable exception is Galiani and Schargrodsky (2016), who also document the problem for the case of Buenos Aires (Argentina), providing evidence of the relevance of costs in the process of de-regularization. We study the case of Peru, one of the pioneers in titling programs in the world, with more than 2 million property titles granted since 1996 in urban areas. Our data shows that only 7.7% of transactions involving properties get registered by owners, which threatens to undo the success of the titling program in the long run. In our study we exploit a natural experiment provided by the elimination of a streamlined registration system targeted for the urban poor in Peru (named Registro Predial Urbano or RPU) to identify how costly and burdensome registration policies can increase de-regularization of properties. The RPU was created to accompany the titling efforts in urban slums, and offered a faster and less expensive registration process that the traditional registry (Registro Predial Inmueble or RPI). The implementation of the RPU followed the geographic rollout of the titling program. Since the start of the titling reform in 1996 until 2004, both RPI and RPU co-existed in unison, although serving different populations. However, in 2004 the RPU was discontinued and absorbed by the RPI. Consequently, slum dwellers served by the RPU suddenly faced identical costs and complexities for registering transactions as all other citizens that used the RPI. This change provides a natural experiment that allows studying how costly and burdensome registration processes affect the probability of registering property transactions among poor urban households. 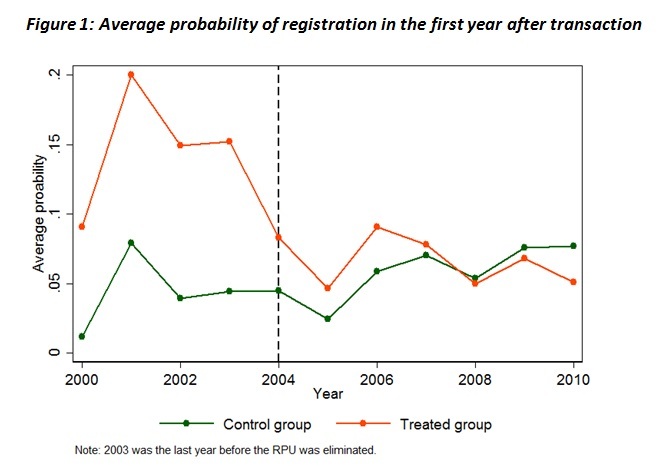 Figure 1 shows graphically the effect of the elimination of RPU on the probability of registration during the first year after the property transaction. We compare districts that were served by RPU (treatment districts) with districts that were never served by RPU (control districts) although they were targeted (because the RPU was eliminated midway its staggered implementation). Initially, the probability of registration was higher (on average more than double) for the treated districts than for the control districts during the existence of the RPU. This demonstrates the importance of a streamlined system to promote registration among the poor. After the elimination of the RPU in 2004, the registration rate for the treated districts declined to levels similar to those for the control districts. We estimate that the elimination of the RPU resulted in a statistically significant 8.1 percentage-point reduction in the probability of registering a transaction. When we analyzed the heterogeneous effects of our results, we noted that households in the lowest quartile of income per capita and households with a more educated head of household were most affected. We argue that both findings can be reconciled because the elimination of the RPU increased the costs of registering a transaction and also the complexity of the process (e.g. the number of steps required for registration). The increase in costs was likely to be a significant barrier for households with lower earnings. The increase in the burden of the registration process is likely to have affected more educated households, who in the absence of the reform were more likely to register their property transactions. Among the different types of transactions, we found that the elimination of the RPU had the largest effect on the probability of registering property divisions and early inheritances (from 73% during the existence of the RPU to 11% after its elimination)—precisely the types of transactions that require registration to preserve the legal claim of rightful owners. Poor households are caught between certain immediate costs of registering a transaction (e.g. fees) and uncertain future benefits. However, households make these decisions with little knowledge regarding the perils of not registering their property transactions and the legal complications and expensive procedures to correct this problem in the future. The policy implications are serious. In time, there may be a high percentage of property owners in urban slums who are not the legal owners according to public records, which reduces their tenure security and limit the potential associated benefits (e.g., use the property as collateral for a loan). Our results indicate that maintaining a low cost, streamlined registration system is critical to preserve the success of property titling programs. 1. Di Tella, R., Galiani, S. and E. Schargrodsky (2007) “The Formation of Beliefs: Evidence from the allocation of land titles to squatters” Quarterly Journal of Economics, 122, 209-241. 2. Field, E. (2003) “Fertility responses to land titling: The roles of ownership security and the distribution of household assets”. Mimeo. 3. Field, E. (2005) “Property rights and investment in Urban Slums” Journal of the European Economic Association, 3, 279–290. 4. Field, E. (2007) “Entitled to work: Urban property rights and labor supply in Peru” Quarterly Journal of Economics, 122, 1561–1602. 5. Galiani, S. and E. Schargrodsky (2004) “Effects of land titling on child health” Economics and Human Biology, 2, 353–372. 6. Galiani, S. and E. Schargrodsky (2010) “Property rights for the poor: Effects of land titling” Journal of Public Economics, 94, 700–729. 7. Galiani, S. and E. Schargrodsky (2016) “The Deregularization of Land Titles”. NBER Working Paper, No. 22482. 8. Gutierrez, I. and O. Molina (2016) “Reverting to Informality: Unregistered Property Transactions and the Erosion of Titling Reform in Peru” RAND Working Paper No. 1156.